Few people take responsibility for their failures. In the case of low consumer sentiment, consumers are failing to take responsibility, preferring to blame the government. Consumers are carrying household debt at 150% to their disposable income and are desperately seeking out bargains and paying lip service to 'Australian Made' as they incessantly buy foreign product in their hunger for cheaper products. It is these factors and opposition fear-mongering, not the economy, which have destroyed consumer and business confidence in the market. In fact, consumer sentiment is merely one aspect of an interconnected economy; it is one very important factor impacting an holistic economy. Australia's economy is one of the strongest in the OECD. Interest rates are low, employment is low, the current account deficit is lower than any time in the last 10 years, but paradoxically consumer and business confidence is low. A number of factors are driving confidence, not least of which is uncertainty in global markets, particularly in Europe and USA. There is also obvious concern about the impact of the carbon tax which commences on 1 July 2012. Yet with fewer than 500 companies being taxed and considerable tax benefits for tax-payers, the impact on the consumer should be minimal. Of greater risk, is companies using the carbon tax as an excuse to price gouge, taking advantage of the ignorance of the consumer. The government needs to monitor this to ensure that increases are justified. Even though the Australian economy is strong, the Labor party has failed to adequately explain this to the public. The Rudd and Gillard administrations have been fraught with debacles and perceived debacles which have been exploited by the opposition. Low consumer confidence is reflected most noticeably in depressed retail and services sectors, with many businesses struggling to meet budgets. Perhaps the biggest threat to these sectors has been the level of household debt. In 1996, household debt was around 70% of household disposable income, by 2007 it was around 150%, which is the highest in the world. Since 2007, it has remained relatively static with a slight decrease in interest paid on the debt due to the RBA reducing interest rates during this time. Household debt increased dramatically because of a significant increase in housing prices resulting in higher mortgage levels. Home ownership wasn't just sold as a necessity or as a way of avoiding rent, but as a means to wealth. Home buyers were sold the illusion that they could become exceedingly wealthy through real estate. They embraced this dream with a fervour reminiscent of Gordon Gecko in the 1988 movie 'Wall Street'. As stories abounded of untold wealth through real estate (and to a lesser extent through the share market), consumers were practically chanting the Gecko mantra 'greed is good' as they bought the bigger house, the investment property, or invested heavily in the share market. Mortgages, equity and margin loans rather than being anathema to astute investors, were revered as 'good debt' leading to financial freedom. Nothing could be further from the truth. They were sold a dream based on unfettered capitalism. They were sold a lie that would make a few rich at the expense of many. Contributing to this has been increases in credit card debt as consumers are manipulated by businesses to "keep up with the Jones's". A strategy that has at its core 'perceived obsolence' as a result of new models of everything being released regularly. The retail sector has been their own worst enemy in this regard, promoting 'interest free' terms to entice consumers to update products regularly, but which contributes to higher household debt, ultimately reducing net disposable income. This in itself becomes a vicious cycle, as net disposable income reduces, so does the purchase of some products, while fuelling increasing credit card debt in order to buy 'essentials'. Large debt, means large debt repayments, affecting the willingness of consumers to spend, reducing retail sales and further depressing the retail sector. It also impacts on the real estate and services sectors as people are less willing to spend. A quick comparison of household debt (at 150% of disposable income), to government debt shows that in 2010/11, federal government receipts were $282 billion, while government payments were $336 million, which is approximately 120% of income. In the 2012/13 budget, government receipts are forecast to be $378 billion and government payments $372 billion, providing a small surplus and outlays of 98% against earnings, providing an underlying cash surplus of $3.5 billion. (Reference accessed on 19 May 2012: http://www.budget.gov.au/2011-12/content/bp1/html/bp1_bst10-04.htm). Consumers complain about local manufacturers such as Pacific Brands taking their manufacturing overseas, yet these decisions are made so that the manufacturer remains competitive and solvent. Australians are not buying the Australian manufactured product because generally t is more expensive than imported items. While we see some loyalty to Australian products it is not enough to maintain the Australian manufacturing industry. Consumers do not want to pay full price for anything and will often try to bargain retailers down, often playing one against the other. 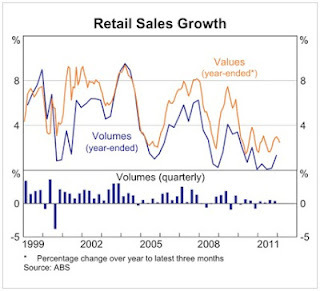 Whilst this is fantastic for the consumer's hip pocket, it is doing nothing to improve the retail industry. Retailers are often forced into offering huge discounts to attract consumers. Online shopping through foreign websites has also affected the local market. Many overseas sites sell products cheaper than they are sold in Australia and will offer free postage. How can a consumer resist such a saving? How can the local market compete while remaining profitable? The high Australian dollar is having an impact and is encouraging Australian's to shop overseas while discouraging foreign investment in Australia. Domestic online shopping is also affecting the local retail market. Large retailers enable consumers to purchase groceries and goods online, which reduces the number of people going to shopping centres. This directly affects the smaller retail stores as few people go to a large shopping centre just to visit a small retailer. Usually the small retailer only benefits because of shoppers who are there to visit a larger retailer. 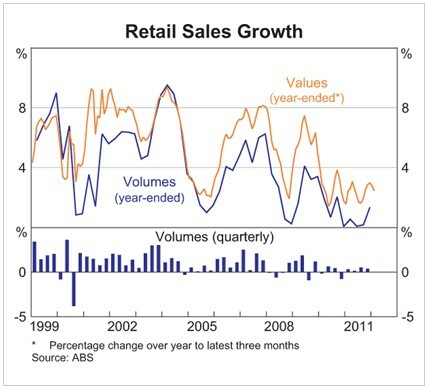 The following charts shows the decline in retail sales, which mirrors the trend in consumer confidence. Following the GFC in 2007/8, there was a recovery in both retail sales and consumer sentiment following Kevin Rudd's economic stimulus packages which protected Australia from the worst of the GFC. In 2010 there is another sharp decline, most likely as a result of the 2010 election which resulted in a hung parliament. There were no winners from this election as both major parties were forced to compromise with the independents in order to form government. Out of this, Labor was returned to power, but in doing so had to renege on an election promise of not introducing a carbon tax. This compromise was exploited by the Liberal party who claimed Labor had lied during the election campaign. Lie or not? Had Gillard won government in her own right, would she have introduced a carbon tax? It is unlikely, so it is inaccurate to say she lied. She did, however, compromise. 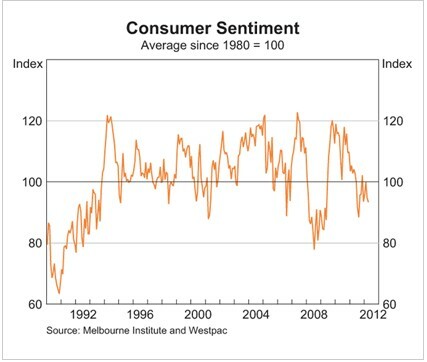 Nonetheless, the accusations of lying and the fear-mongering by both the Liberal party and the business and mining sectors have dramatically affected consumer confidence as people fear the impact on household budgets when the carbon tax commences on 1 July 2012. We cannot solely blame the government for low consumer confidence. The consumer is carrying massive household debt at 150% of disposable income. Many of us complain about government debt, yet it is affordable. 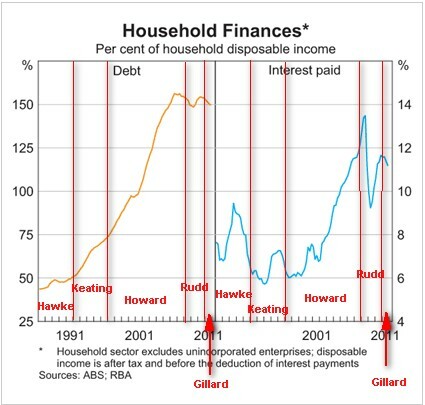 Of course debt is different to deficit. The opposition demonised the term deficit even though government deficit is not necessarily a bad thing. To sit on a surplus during a recession would be grossly irresponsible, tantamount to Nero fiddling while Rome burned. The government needed to spend in order to keep the economy moving and to protect jobs - hence the 'stimulus package'. Nonetheless, if forecasts are correct, the economy will return to surplus during the next financial year. The government has been managing the economy responsibly. The consumer has not managed their own debt as well. Consumers criticise the government's financial management, yet it is the consumer who has the unaffordable debt, not the government. Numerous factors affect a nation's economy, including government policy, market behaviour and conditions, consumer and business sentiment, decisions by the Reserve Bank and foreign influences. No one factor can be held solely responsible, however, each factor has a responsibility. At risk of sounding like an holistic economist, to quote the Douglas Adams character, Dirk Gently, 'it's the interconnectedness of it all'; no factor operates in isolation. Australia has a strong and growing economy as a result of government policy and RBA decisions. Consumers and businesses need to stop blaming the government and take responsibility for their role in the economy. They may have some influence over government policy through voting and lobbying, but they have the most ability to improve their own confidence in the market, which helps to stimulate the economy, including employment and business growth. Consumers and business need to take responsibility for their behaviours, stop listening to fear-mongering and negativity and instead cultivate that confidence. Instead of the constant whinging and criticism, consumers and businesses should appreciate just how secure and stable Australia's economy is. It is this that will build the confidence. thanks for that. I'm now following your blog. I write and maintain a blog which I have entitled “Accordingtothebook” and I’d like to invite you to follow it. I'm following on Twitter as well. Thanks for that, I'm now following your blog.